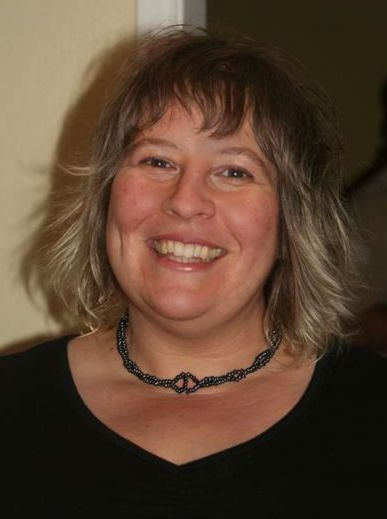 Belinda is an re-connective healing expert and works with animals not to treat symptoms, but to treat the whole animal. Belinda mentioned that many animals actually mirror their guardian’s illness and disease. Researching and studying the ancient Hawaiian healing practices has been a passion of Belinda’s and about 15 years ago, this impacted her life in a very positive way. We talked about the power of re-connective healing, and what is so incredible is that the healer does not actually physically touch the animal. The healing occurs by being present and using deep empathy and helping the animal to get into an extremely calm state. Belinda talked about some incredible examples of animals who in 1-3 sessions, experienced dramatic improvements in their health. This form of healing can also reduce anxiety and depression in animals, and is extremely beneficial for animals who have experienced trauma . Wouldn’t it be wonderful if all shelter animals had the opportunity to experience this type of transformational healing? You can adopt animals, and even shelters! - Creating conversations- word of mouth marketing is not only effective, it is essential for any business. As my friend and media coach Shawne Duperon says, “share good gossip!” Adoptashelter.com is a great example of creating conversations around the needs that shelters have in addition to financial support. - Marketing that works- postcard campaigns, and postcards that go with the adoption kits in shelters, Facebook, a How It Works flyer, and asking organizations and shelters to share the link in their marketing. 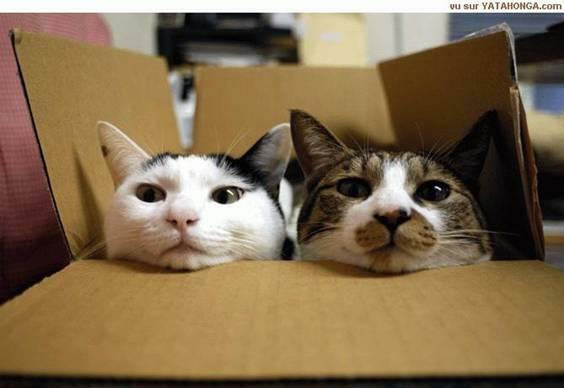 Think outside the box, and inside the box! - Making the process easy, painless and focused is really important otherwise people would be less inclined to use the service. Chris got his start in the pet industry in 1989, when he introduced dried Pig Ears, Bully Sticks and other all-natural meat-based chews and treats to the U.S. market. In subsequent years, Chris worked on such industry-leading brands as The Incredible Motor Mouse Cat Toy, Snoopy's Pet Beds, Collars and Leashes, Sticky Paws Cat Behavior Modification Products, Barnsdale Farms and Bullwrinkles Dog Treats. As Founder & CEO, Chris teamed up with three other pet industry and animal welfare veterans to develop and offer AdoptAShelter.com, a free and easy-to-use cash-rewards mall that helps animal charities raise money by shopping online. To date, over 750 shelters have registered with us and over 100 have received donation checks. If you are a shelter staff or volunteer or have a favorite shelter in your community, make sure you visit www.adoptashelter.com to register your shelter. Oh no! My dog has been bitten by a snake! What do I do? Would you know what to do if your dog was bitten by a snake while out for a Sunday walk? My guest, Karen Singleton helped answer that very question on PAWsitive Radio- all things pets, which is my weekly radio show. The first step in avoiding snake bites is to become informed. Take a course, read up on the subject, and plan your hikes in advance. The second tip is to have a snake bite emergency kit with you when hiking in the bush. The third great tip was that if your dog has been bitten, carry the dog back to the vehicle or immediately to help. If the dog is walking, it expedites the reaction and puts the dog at further risk. Please feel free to share this link with others, let's get the word out there. Awareness saves lives! We travelled a great deal with our dog Toby, always by car. And before I created a checklist, we always forgot something at home. This is how we ended up with too many brushes, duplicates of toys and harnesses. We also had a backpack that was stocked with a few toys, a baggie of dog treats, poop bags, a brush, a leash, a collapsible water dish and some paper towels. And always had water in the vehicle. You never know when there may be a road side emergency. In our trunk we also had an emergency blanket, first aid kit and survival kit. Safety First! 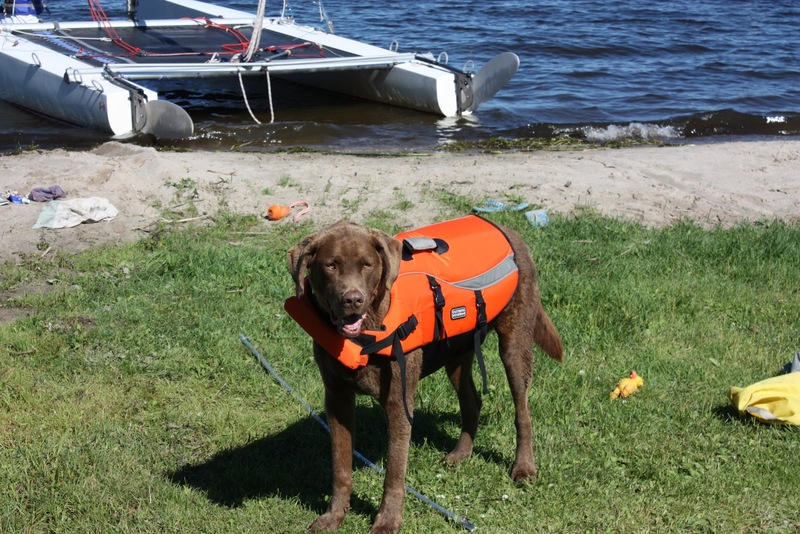 Toby the dog in his Outward Hound Life Preserver. 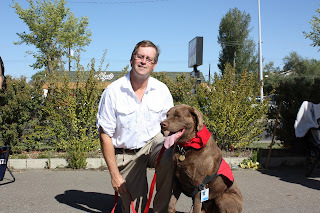 Animal Assisted Therapy Dogs... making a PAWsitive Difference! Therapy dogs make a significant difference in the lives of people around the world. From volunteering in hospitals, seniors homes, group homes, schools, reading programs, mental health facilities (to name just a few), AAT (animal assisted therapy) dogs reduce stress and anxiety, and can positively impact a person's physical health and emotional state. Chimo Animal Assisted Therapy Program Booth. Listen to a great conversation I had with Renee on the radio....we were talking about Toby's story, animal assisted therapy and Toby's book Toby The Pet Therapy Dog & His Hospital Friends. 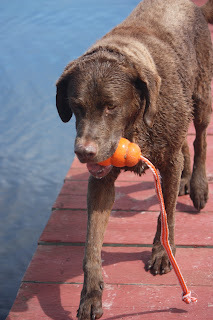 "Toby is a big, brown, happy dog. Every week, his owner, Miss Charmaine takes him to visit and comfort children who are in the hospital. Follow Toby the service dog for a day, and see how he makes friends with the children, helps make them happy and forget that they are sick and away from home." Beautifully illustrated, Toby, the Pet Therapy Dog teaches young readers the wonders of being of service to others. A happy story that also sends a positive message about community, as well as the importance of kindness to pets. http://www.chimoproject.ca/chimo/ and listen to Danielle from Chimo Animal Assisted Therapy on PAWsitive Radio- all things Pets! We'd love to hear about your animal assisted therapy program, or your favorite story about therapy pets. 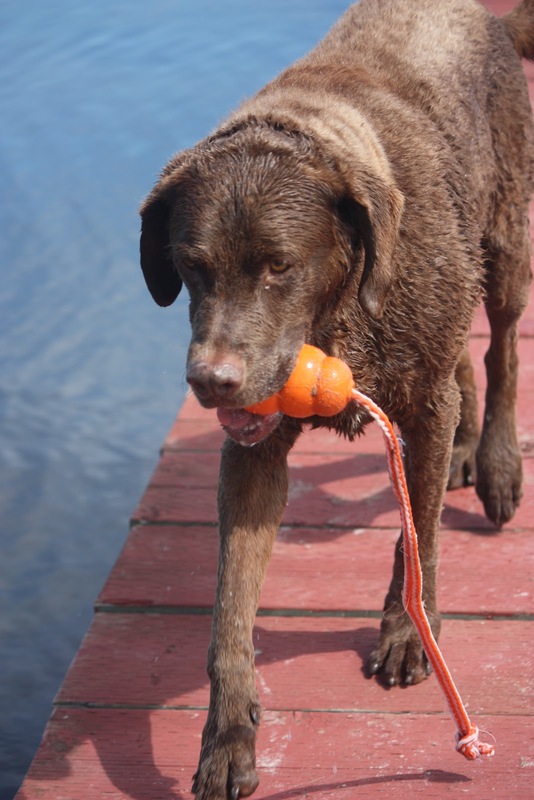 Our dog Toby, a Chessie who lived life big, created wonderful memories and who inspired PAWsitive energy wherever he went. The most typical training issues are: leash training, aggression, pulling on leash, jumping up, biting, and house training puppies. 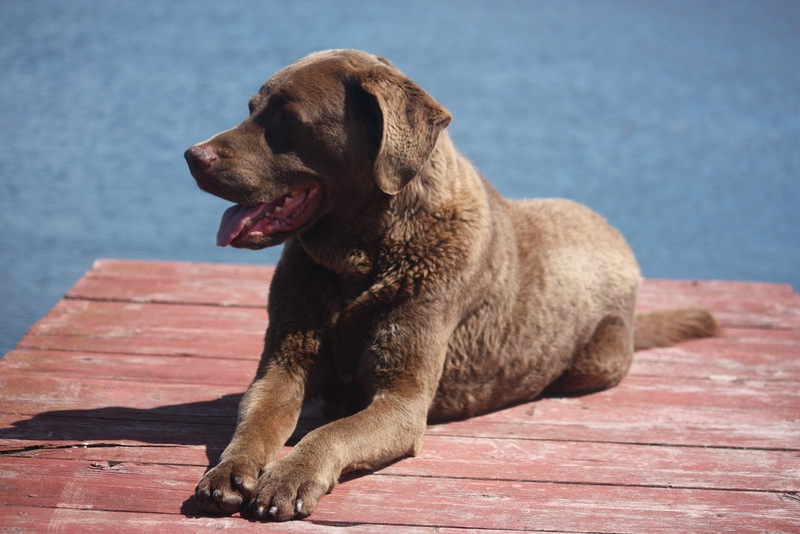 Georgina shared some tips that pet owners and pet parents can implement right away. 3) Watch what you transfer down the leash. If you are nervous, you transfer that down the leash. I loved this tip because it reminds us as pet owners/pet parents to be so aware of what we are giving off to our pets. When I discovered not play into our dog Toby's fear of thunder, his response changed dramatically. I used to reassure him "Toby, everything's fine." or "It's ok Toby" or similar comments, and keep petting or cuddling him. When I discovered that I was transferring fear instead of reassurance I was really quite surprised. But not nearly as surprised when the trainer suggested that during the next thunder storm I resist my need to reassure Toby, and play his favorite game instead. As soon as the first thunder clap hit, I grabbed Toby's Kong and said "Let's Play, Toby! Get your Kong" and I tossed it a few feet away. As he grabbed the Kong another thunder clap roared through the house. I smiled and laughed (still resisting my urge to simply reassure him) and said "bring it here Toby". Tail wagging he happily returned the Kong. We did this a number of times then I said "Lay down on your matt." which he did. The next thunder clap alarmed him and he got and paced and again.... I resisted the need to reassure him and gently moved his kong around on the floor with my foot. His anxiety was noticeably reduced. This training was wonderful for Toby, and for me. September-2012 –On Toby’s Terms, the bestselling memoir by author Charmaine Hammond about the journey she and her husband Chris Alcock take after they rescued their dog Toby, a Chesapeake Bay Retriever, has recently been honored with a gold medal in the Readers Favorite Award Contest Non Fiction-Animals category. On Toby’s Terms is an Amazon bestseller and soon to become a major motion picture. There is also a children’s book series featuring Toby working his miracles as a pet therapy dog. Charmaine Hammond, MA, BA, is an international transformational speaker, helping people live inspired, resilient lives and is a leading trainer in corporate North America helping transform workplaces.Charmaine is also the co-author of new book GPS Your Best Life-Charting Your Destination and Getting There in Stye (Bettie Youngs Books, Sept. 2012). Charmaine has been featured on CBC, CTV, Global TV, 820 CHAM, Alberta Prime Time News, many major newspapers, and in various magazines. Because of our dog Toby, I have met some of the most amazing people, and animals. Our precious friend Toby passed away late 2011, and we miss him dearly....every single day. Toby was a dog who lived life big and left pawprints on hearts around the world. Sadly, our animal friends just are not with us long enough, however, their friendship and unconditional love is a beautiful memory of how our pets impact our lives. The conversation about pet loss is an important one and I am delighted to introduce you to our guest blog author, Reisa Stone. Losing your dear companion to death is one of the most devastating things that will ever happen to you. You've lost your best friend and a source of completely nonjudgmental love. When I lost my heart dog Chant, I was inconsolable. It took not one, but two interventions to get me to surrender her to a pet funeral service. I placed her body in a snow bank at my back door. For three months, I answered concerned inquiries with a brusque, "She's fine." I made disastrous career decisions. I gained 20 lbs. by watching TV all night, chain smoking and eating junk food instead of going to the gym. Then, Chant visited me from the Rainbow Bridge. She taught me a profound spiritual lesson that eased my heart and mind. Through the loss of many animals, both my own and those I've cared for, I've learned valuable lessons. I know that if your loss is recent, it feels as if your guts have been ripped out. Please believe me, the acuteness of the pain will lessen in time. 1. Minimize contact with anyone who minimizes your loss. Mainstream society still regards pets as "less than." Seek support from people who understand your devastation. Reach out to a pet loss hotline and work with a pet loss professional. Create a bubble around yourself where the phrase, "Just a dog...cat...horse, bird, rabbit..." is disallowed. An assertive statement might be, "She was much more than that to me." Ask for practical support, just as you would expect if a human being had died: help with meals, transportation and funeral planning. 2. Allow yourself to genuinely grieve. Let the tears flow. Anger is also part of coping with death; work it out at the gym, in a journal, with paints or even by ripping newspapers apart. There is no time line for grief. It will come in waves and have its own cycles. 3. Take extra good care of yourself. Nutrition, exercise, hygiene, sleep, vehicle maintenance and a social life are vital. Keeping up these basics will help you get through the grief. If you can afford to hire house cleaning help, book a massage or take a cab when you feel too down to drive safely, please do so. 4. Support children through the loss. Ask them to express how they feel. Provide art materials so they don't have to find the "right" words. Tell neighbours and teachers, so they may expect sadness or anger. Be honest with your child. Tell them their pet died, and that this painful fact is part of life. They didn't go to sleep, get taken by God, or run away. These concepts upset and confuse children. They may feel responsible for the loss of their pet, and fear both sleep and God. Tell them they'll see their pet again according to your belief system: in Heaven, at the Rainbow Bridge, in Nature, in another form, etc. 5. Hold off on drastic actions. If seeing your pet's toys, dishes, etc. is difficult, put them away in a safe place. Don't throw them out, as you may regret this. Give yourself time to work through the initial crushing emotions. 6. Wait to adopt a new pet. It's natural to want to salve your emotions, but you're best to give a new addition to your family careful consideration. It's very common in the initial stages of grief, that we try to find a "replacement." Of course your precious pet can't be replaced. If you make a hasty decision, you may find it's unfair to both you and the new animal. Both of you deserve a well considered relationship. 7. One of the best remedies for grief is to be with others who are grieving. Find a pet loss group, or simply open the subject with other pet owners. Almost everyone who has a pet, has also lost pets. They'll understand. Shelter pets are usually in a state of bewilderment and grief. They don't understand why they've been abandoned by those they love most. If the thought of volunteering to give a grieving animal a bit of play time and sunshine doesn't drop you to you knees, try it out. When you are ready for a new pet, I guarantee they'll show up at just the right time. 8. When you're ready, create a memorial. Treasure your companion's memory with a scrapbook, special photo album, altar or garden. 9. Give yourself a break. While grieving is necessary, so is resting from grief. Linger in places that don't remind you of your pet. Unless yours was a service animal, they probably didn't go everywhere with you. Linger a bit longer at the coffee shop, read a book or use a computer in the library, stay a few minutes more at the pool. 10. Study and seek spiritual perspectives on pet loss and grief. Rainbow Bridge contact can be immensely comforting, as can reading literature discussing the fact that pets have souls. Write down dreams about your pet. These are often actual visits. Note any impressions you have that your dear companion is contacting you: a vivid dream, the unusual appearance of a butterfly or other natural phenomenon, a fleeting glimpse of them from the corner of your eye. Our pets will seek to contact and comfort us. We need only be open and observe their messages. I hope these ten tips have been helpful for you. In my experience, we never stop missing the soft fur or feathers, the wise and loving eyes. However, we can take care of ourselves and also reach out to our dear companions in the spirit world for assistance. The excruciating initial pain does heal. Animal Communicator Reisa Stone is also a passionate animal rescuer. She's offering a day of training to help another rescuer awaken their intuitive gifts. She's looking for an outstanding individual. You may be a shelter volunteer, a wildlife rehabber, or someone who quietly takes in strays and finds them good forever homes. 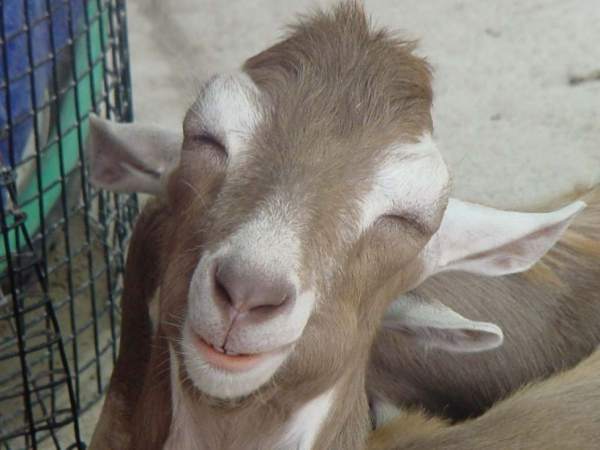 You can't imagine not acting in the face of animal suffering, and you wish you could hear their sweet voices. 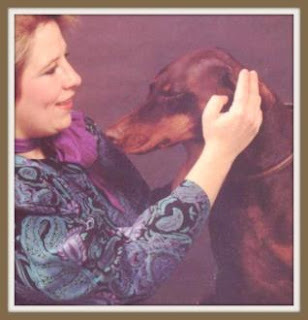 The Rockin' Rescuer Award will go to one particularly effective rescuer who wants to learn Animal Communication. The Award winner will be granted a day of learning at the Vancouver Talking With Animals workshop, plus a follow up call. This is a full scholarship. Submit a short essay describing your rescue work. 500 words or less. Reisa is looking for sincerity, and effectiveness as a rescuer, not professional writing. Write from your heart. Describe how you think Animal Communication would benefit your work. The Deadline is September 12th for the September 22nd workshop.